My how time flies. As I sat down to write a new column, I realized that I’ve now passed my two-year anniversary at EBA. My roots at Hi-Torque actually go back a bit further than two years. Early on in EBA’s four-year existence, I was contacted by a friend who worked at Hi-Torque who told me that then-editor Karel Kramer had suffered serious injuries in a car accident. Knowing of my journalism and e-bike history, he asked if I might be able to help come in and help with a story or two while Karel healed up. I was happy to jump in for what I thought at the time would be a temporary gig. As a professional photographer back in the day, I shot the advertising and PR photos for Lee Iaccoca and his e-bike. That was back in 2001, and by today’s standards, the bikes were just terrible. They used lead-acid batteries and were very heavy, expensive and had little range, but Lee saw the future and invested heavily in it. Unfortunately, he was about 15 years ahead of his time. As Karel healed, we developed a friendship and he taught me a lot. I kept contributing one article or more per issue. When an opportunity presented itself to him within the company to move over to the powersports side as editor of Dirt Wheels, he asked if I’d be interested in taking over as editor. I thought about it—not for long—then dove in headfirst. In the two decades I spent as a photographer, I’d never worked for someone else full-time. And although I’d worked for various magazines, interestingly, I had my start right here at Hi-Torque. That was when my friend John Ker brought me on to work for American Freestyler magazine and ultimately at BMX Plus! magazine. Both times (for BMX Plus! and EBA) it was like baptism by fire. In the last 26 or so years the company had changed quite a bit, and since I hadn’t been privy to these changes, I’ve been playing catch-up. I work with some of the most amazing, dedicated people who bring this magazine and six others to life every issue, and I couldn’t be more grateful to them. There are some legendary people, including guys like Tom Webb, Zap Espinoza and John Ker, and unsung heroes throughout the company, like Stephanie Sun, who makes sure my grammar doesn’t make me look like the dolt I may actually be. Since my time here I’ve also had the amazing opportunity to talk to a lot of readers and consumers, constantly learning more about electric bikes and the people who love them and those who inexplicably hate them, which is almost always someone who hasn’t ridden one. 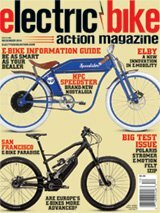 Although 90 percent of Americans still don’t know that electric bicycles exist, I feel that is rapidly changing. I’ve seen legislation expand and include e-bikes, and I’ve seen situations like New York that are perversions of what the law should include/exclude. We are still in the infancy of this industry, especially in the U.S., and this industry is poised to explode! Police departments are learning about them and some are even implementing them. I wrote articles about some of them when I was freelancing for this magazine. Now, I’m consulting with one of the largest police departments on the planet about electric bikes. And if it progresses as quick as it seems to, in the next issue you’ll see an interview with Los Angeles Chief of Police Charlie Beck who talked to us about e-bikes and the future of policing. In fact, I was able to attend some of the LAPD bicycle training sessions and was able to see the sheer fear in the new bicycle officers’ eyes as they were asked to ride down two flights of stairs. As I looked at the stairwell, all I could think about was wanting to jump on a bike and ride down them just like I did when I was kid. Hopefully, I’ll get to do it on an LAPD-spec’d e-bike during a week of police bike training, because I’m chomping at the bit for that! I’ve gone riding with the Chief, and I was happy to find out that he’s a huge proponent of e-bikes. Working with his training officers and people, I’m sure this project will be a huge adjunct to how e-bikes are used in policing world-wide and spur interest in one of the greatest innovations in the transportation world since the automobile. Stay tuned and get out and ride!